"Excuse me. Would you be interested in buying our cow? It steers like a dream!" There's usually an episode during a series run that more or less serves to be the "go to" reference point for fans, the kind of thing that gets remembered above and beyond all of the other storylines. And for the Animaniacs series, that moment shows up here in this five-disc Volume 3 collection, and strangely enough doesn't feature the wacky antics of the titular Yakko, Wakko or Dot. It's entitled Yes, Always (original air date 02/11/94), and stars the take-over-the-world musings of Pinky & The Brain, in which the recording of a commercial voiceover becomes the stuff of geek fan legend. The segment serves up an exasperated Brain attempting to read and re-read his lines while Pinky's controlling producer role requires take after take. Funny stuff, but what makes this one such a classic is that it is literally a line-for-line reenactment (minus some expletives) of an infamous Orson Welles outtake where the actor/director was struggling through an identical voiceover gig. The obscurity of that Welles-ian reference�and to make it the basis for an entire segment in an animated series theoretically built for kids�gave the Animaniacs series a hip, insider coolness, and if you do a Google search on "Orson Welles peas" you can find the original and see for yourself. So with that grand reference point out of the way, there's still five discs worth of episodes here, a circus-like explosion of animated comedy and pop-culure references with a large, rotating ensemble. And over its run, that variety-pack mentality of characters is what gave the Animaniacs its unpredictability. 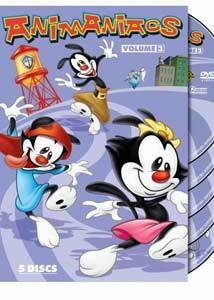 The stars are ostensibly still Yakko, Wakko and Dot, those crazy Warner siblings living in a water tower on the studio lot, but a deep pocket of mostly enjoyable supporting players gave the series an opportunity to not have to rely solely on their hijinks. Some of the offshoots, such as the Goodfellas-as-pigeons Goodfeathers segments, were a bit weak, as were the hit-or-miss storylines with Tiny Toons offshoot Elmyra Duff, but there was always funny lurking in the wings with Pinky & The Brain (see a signature moment like the aforementioned Yes, Always) or Slappy Squirrel (Woodstock Slappy has the curmudgeonly squirrel in 1969 at the big concert, and features a nice variation of "who's on first"). Remember I'm speaking as an adult who enjoys the Animaniacs. I have no clue if kids dug this show as much as older viewers, because the odd pop-culture nods sprinkled throughout don't really speak to the under 8 crowd. There's a random Dana Delaney reference in one of the variants of the opening theme song�maybe not cutting edge, but strange nonetheless. There are a mass of subtle double entendres and obscure "grown up" references would sail well over the head of youngsters, but burst forth with a nudge-nudge-wink-wink boldness (check out the voluptuous Nurse) that were a longstanding mark of distinction that separated this "kid's show" from the rest of the pack. An ep like the manic assembly line comedy of Ragamuffins is presented in black-and-white (save for the Animaniacs' red noses), and is a lovely homage to Steamboat Willie-era animation; and it's a great block of physical comedy, too. There's an even a clever takeoff on Macbeth, the finer points which surely would have been lost on the grade school set. All of this only-adults-would-get-it humor really comes through with an ep like disc three's The Warners' 65th Anniversary Special. Presented as a variety show tribute to Yakko, Wakko and Dot, even the opening credits are a subtle old school parody, so low key that it might not even get noticed. Maybe the Bob Hope/Liza Minnelli gags are a bit dry, but the way this one offers up a fictitious history of the Animaniacs, presented in part with a series of "vintage" black-and-white shorts, is top-loaded with an almost-too-inside-the-industry brand of humor. A few mainstay Warner Brothers characters make appearance (including Bugs Bunny, Yosemite Sam, Foghorn Leghorn), but they're wedged inbetween Jimmy Cagney references and parodies of award show production numbers. I've often wondered who this series was really made for. It waffles back-and-forth between trying to appeal to two vastly different age groups, often not at the same time. I can't speak directly for the youngsters (though my daughter enjoyed this when she was little), but I like this. A lot. Image Transfer Review: The 1.33:1 fullframe transfers won't impress anyone, with a fair amount of dirt and debris in evidence throughout the five discs. Line edges are hazy and soft, and the level of detail is just lacking throughout. Colors often appear bright, but the patina of dirt often causes big variations in color quality, even in a single episode. Audio Transfer Review: Harkening back to the Carl Stalling days, the Dolby Digital 5.1 surround track is big and loud, serving up orchestral moments and sound effect cues in a pleasantly full-bodied mix. Voice quality is above bar and clear, but the score is where the 5.1 really shines. A somewhat less robust English 2.0 surround mix is also provided. Extras Review: Not a whole bunch of supplements here, with a forced Superman: Doomsday trailer on disc one starting things off. Then it's nothing until disc five, where we're given a few more animation-themed trailers and then a pair of features that cater to the adult fanbase of the series. They're Totally Insan-y: In Cadence With Richard Stone (23m:07s) has writers Randy Rogel and composers Gordon Goodwin, Julie Bernstein and Steve Bernstein talking fondly about the skills of the late Richard Stone. Anyone who's seen the show knows how key music and songs are, so it's a fitting nod to a generally unsung composer. Voice talent Rob Paulsen and Jess Harnell appear briefly, as well. Extras conclude with They Can't Help If They're Cute - They're Just Drawn That Way (22m:21s), which looks at the evolution and design of the characters, and features directors Rich Arons, Liz Holzman, Charles Visser and Russell Calabrese, producers Rusty Mills and Tom Ruegger. Like the piece on Richard Stone, this one is built to appeal to more grownup fans of the series. The transfers are fairly awful, but there's still a lot of funny here. An easy recommendation for Animaniacs completists.